Each year I choose a theme for the year. It's kind of like a resolution. This year I chose healing, with a side of "hold yourself to a higher standard." The healing I was talking about was not only physical, but emotional/social/you.name.it. Since July, I've been practicing my One Better Decision plan and that has been key to making the forward motion in my life needed to heal. What it really comes down to is, if you want to make any sort of change in your life, you have to do something different. 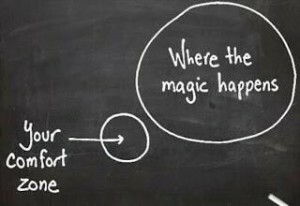 You have to stretch past your usual comfort zone. If you're like me, you not only like your comfort zones, you cling to them for dear life. In some ways, my year of healing could also be called the Year of Living Dangerously, because I've done a number of things that make me feel nervous and vulnerable by way of trying to heal. But I also feel alive, which is more than I can say about the past few years of my life spent in the "comfort" of my usual, sometimes "toxic", behaviors. For example, I can't believe I've flown to Florida four times this year on business. To begin with, it's extremely rare that I even take a professional meeting that isn't conducted over the phone or internet. But to go to Florida means leaving my dogs, which I avoid doing. But I recently made the trip and, for the first time ever, left my dogs to sleep alone at night...and I actually looked forward to the trip and didn't really freak out! Well, I did get choked up when I heard Magick was sad without me, but who wouldn't? So now that barrier is knocked down, I can think of maybe taking a personal trip without them—something I did frequently before I had dogs. Not surprisingly, this fresh energy has opened new avenues for me. I've gotten three new clients so far this year, which is three more than I got last year. And they have interesting projects for me to work on, which is even better. I've been planning more social engagements. I had a friend (other than long-time friend, Katie) over to my house to hang out for the first time in years. And I've also agreed to teach a class for the first time in a couple of years. I'm saying yes to a lot of new and "uncomfortable" experiences and I'm also saying "never again" to some of the old ones. Plus, I'm placing more attention and energy on the people who are rooting for me in life, and giving those who either don't care or are rooting against me the proper place in my life. That's big. Just a few months ago, I felt down in the dumps and in a rut so deep and abiding that I had no idea how to get out. From there, I could have never imagined the choices I just listed above. And now I'm feeling pretty good. When you think of it logically, a rut is being stuck in a repetitive cycle so long that it dampens your desire and/or mental and physical energy stores needed to get out. So the only way out is to break the cycle. And the only way to break the cycle is to start making different or uncomfortable choices. There's no way around it. You won't get out unless you do something different and uncomfortable. And the same goes for things you might not identify as a rut. It can just be an area of life you're unhappy with. Or a goal you want to achieve. If you're a spiritual seeker and you want, say, stop gossiping, you're not going to reach that goal without doing something that makes you feel uncomfortable. If your usual behavior is to talk about others, it will be very uncomfortable to keep your mouth closed and your nose clean. It will be very uncomfortable to indicate to your friends that you're no longer open for that kind of discourse. And, in a case like this, they may even pull away from you because of it. You could actually lose friends. It could be *that* uncomfortable. But on the other side of it will be advancement along your path, a cleaner feeling in your soul and you'll attract new people who have already been through what you have to get there. It sounds weird to say, but the path to greater comfort with yourself and in life in general, is the path of discomfort. Of course, that path is temporary. You're not on it all the time. And it may (or may not) be strewn with destruction and the bodies of those who stand in your way...haha. But it's really the only way. And the more you make it a practice, the more consistently you feel the joy of emergence. Since I started following my One Better Decision plan in July, everything is different. I'm not necessarily making new or better or different decisions every day now, but I did it daily long enough to remain conscious of it and do it frequently. And there are times I slip back into the "dark comfort" of the unconstructive behaviors of my rut, but I'm only there for a visit...a rest between surges forward. And the good thing is that those dark places of laziness and napping and avoidance feel less and less like me every time I visit. One of the things about gliding through life happy and carefree is that it's never a permanent thing. As humans, we're either in a rut or being called to grow when the happiness turns routine and loses its shimmer. And then it's time to get uncomfortable again. So are you ready to get uncomfortable? What can you say yes to this week that you wouldn't otherwise? How far might you stretch if you knew you'd feel good about yourself afterward, regardless of whether you succeed or fail?